Like most of us, you love Indian food – am I right? And like most of us, a trip to the local Taj Mahal or a delivery from the local curry place is the height of your curry experience – right again? But – and it’s a big but – you’ve always longed to have the knowhow to make your own curries, just the way you’d like them? Well this is the experience for you! And it’s a lot easier than you thought. Where can I get an Indian cookery course? There are currently four top quality locations for your Indian cookery experience, though as these change our real time course checker will add and remove locations automatically for you. What’s the deal with Indian cooking classes then? It’s down to you really what you want. From half day Saturday morning cookery classes with a group of other lovers of this spicy cuisine, right up to a full day’s individual one-to-one tuition, with or without lunch thrown in – the choices are all there. Best thing you can do is check out the full list of Indian cookery courses above, click on the ones you fancy, and read in detail all about them. And you can even buy online there and then, knowing that you’ve got the cheapest cookery course available as all our prices are updated in real time. The main problem we have with these great Indian cookery classes is that they’re all in the South. Most things are, of course, but we people in the North are famous for our curry appreciation, and it would be nice to have something further North than Cambridge. That said, all of these cookery courses are top notch run by the best people – how can you get better than Pat Chapman when it comes to curry??? And they all put themselves out to make you feel welcome and explain the ins and outs of making fantastic curry – or indeed other Indian dishes too, as Indian cooking isn’t just about curry – there’s far far more to it than that. The one to one full day course is a particular star in this galaxy of Indian cuisine goodies, as they go to great lengths to make sure the course covers exactly what you want it to do, and they’re happy to talk to you before hand to make sure the day is tailored exactly to you and your own Indian cooking preferences. We’d heartily recommend one of these Indian cookery courses as a fantastic present for somebody. If you check out the reviews of the full day individual tuition course, for example, you’ll see how well appreciated a gift experience it is. Giving the gift of knowledge is always welcome, and the knowledge and skill to cook fantastic Indian food is one present idea that most people will be eternally grateful for. So check out the courses above, get yourself taught how to do it, and get your gift list sorted while you’re at it. 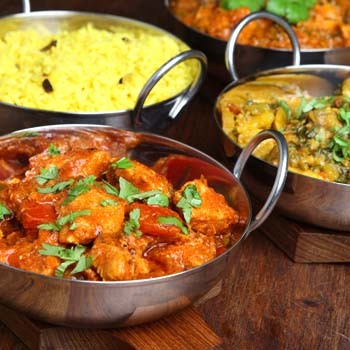 We find that many couple like to go on one of these experiences together to build on their shared love of Indian food, and surprisingly afterwards they normally end up cooking Indian together! Indian cookery courses – curry making experience4.66666666667Sarah FirminIndian cookery courses in the UK run by the country’s top experts in Indian cuisine. Learn curry and other Indian delights solo, or in small groups, and you’ll enjoy your eating for the rest of your life. Woohoo!